Product prices and availability are accurate as of 2019-03-28 19:59:49 EDT and are subject to change. Any price and availability information displayed on http://www.amazon.com/ at the time of purchase will apply to the purchase of this product. Gentle on your skin and your clothes, Dropps natural laundry detergent pods are the safer, powerful alternative. No scents, no dyes, no enzymes and no chlorine means no worries for your sensitive skin and no compromises when it comes to clean clothes. 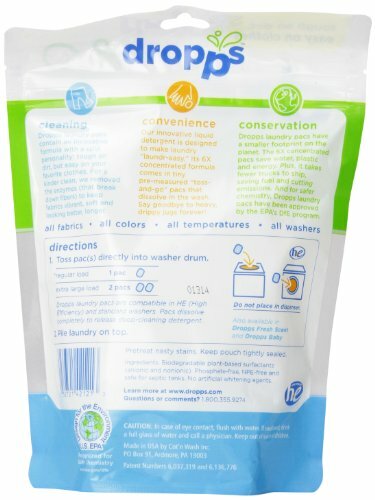 Dropps laundry detergent uses a premium concentrated formula that’s , biodegradable, hypoallergenic, non-toxic, and non-irritating. That means nothing but pure cleaning power since the pods completely dissolve in your washer, penetrating tough stains right at the source. 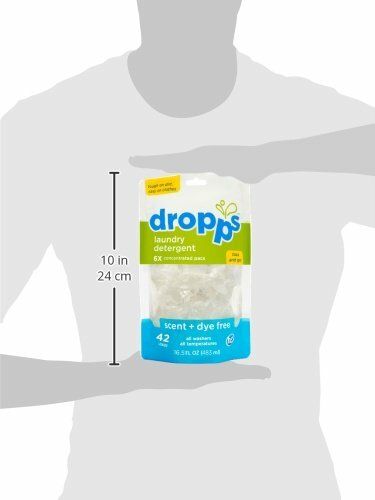 Dropps Laundry Detergent pods are pre-measured, so there's no messy measuring and no heavy lifting. One pod for one load is all you need. Dropps is perfect laundry solution for all washers (both standard and HE washing machines), all temperatures, all fabrics (from fine cashmere and silk to activewear) and all colors. Not only is Dropps the safe choice for your family, it's great for the planet: we don't waste water in manufacturing or waste energy transporting heavy plastic jugs. That's why Dropps pods have been approved for EPA’s Safer Choice program that recognizes products with safer chemistry. Lighten your load with Dropps.